Paper Submission notification received by mail Track your paper status. 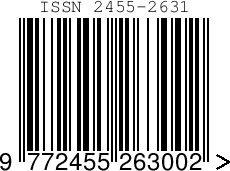 authors will get the Paper registration id in the corresponding's author mail inbox. Payment of Publication charges on acceptance of paper. Publication of Paper: Paper will be published within 2-7 days after submitting all necessary documents. 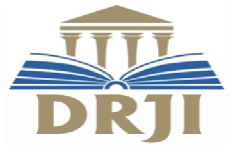 IJSDR provide the account to each corresponding author individual. Once the paper submitted to IJSDR, corresponding author got the Account credential details in author provided Email address. Authors can check his/her paper details, Authors Details and Paper status from account. 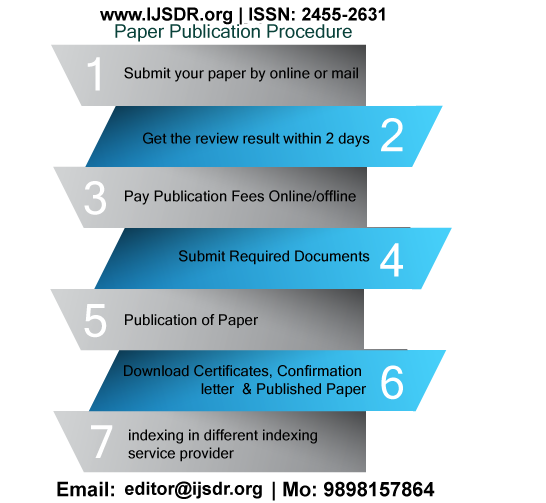 Authors will download the soft copy of the published paper certificate and Published paper pdf file from his/her account after the paper will successfully published. Once paper will be accepted by IJSDR reviewer committee, author got the notification from the IJSDR Team. Then after author have to pay the publication fees. Authors have to submit the following required document for further process for publishing. Submit Following all document in single mail (forms are available on our website- www.ijsdr.org) and send to editor@ijsdr.org mention your paper registration ID in the subject. Identity Proof of corresponding author's only) (scanned copy) (any one from election Card/PAN Card/College Identity card/Driving License. IJSDR Started “Go Green Initiative “by providing e-publication of research paper and Certificate.